The War of the Roses refers to various conflicts between 1455 and 1485 between the House of York, the white rose, and the House of Lancaster, the red rose, both having originated from the Plantagenet dynasty. Wars between the Houses continued from the reign of Henry Vl through that of Edward lV to the time of Richard lll when, in 1485, Yorkist Richard was defeated at the Battle of Bosworth Field by Lancastrian Henry Tudor who later married Elizabeth of York, thus uniting both Houses hence the Tudor Rose, an amalgamation of both emblems, and the commencement of the Tudor period. All three hand carved designs are available on both jack and tankard body shapes with an approximate capacity of one pint. Capacity of Yorkshire Rose Jack or Tankard One pint - Approximately. Capacity of Tudor Rose Jack or Tankard One pint - Approximately. 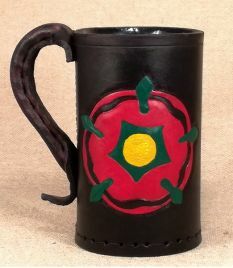 Capacity of Lancashire Rose Jack or Tankard One pint - Approximately.